I feel the shift...................I can't quite explain it - but it is happening. 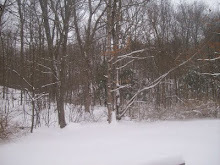 Despite the joy and frolic and innocence Gracey-Blue has brought to us - the shift is still occurring. I believe Gracey-Blue is providing purpose and balance amidst the presence of movement. No matter what the shift Gracey-Blue's needs remain consistent. There is comfort in that. I do know when the shift started. It was January 2nd 2010 - when my Sis had the heart attack and had to have two arteries cleared and stinted. I have not got my feet planted on solid ground since. Add to that my BP meds needing to be changed, again and I started to spin a bit with wonder and whys and what ifs. Oh I know how out of tune with the universe that type of thinking is and how it does not give way to staying in the moment, blah, blah, blah. It is a restless feeling and I believe that restless means change in coming. I feel it moving within me, sort of under me and through me all at once. The earth is moving under my feet as I try to stand firm. And so I realize - I am doing all I can to manage my own health - both the MS and my blood pressure. I trust my PCP and he will get the right blend and dosage. He is NOT worried. And for the most part I do not live in the limits of MS but rather the freedoms. So what is this shift, movement, momentum with a force of it's own that I am feeling - and how do I go for the ride with faith and trust that all is exactly as it should be. At times I do just that and at times i scream "Whoa - I want to get off". Today, so far, I feel balanced. The rumble of the movement is slow and barely noticeable - I know it is there but it is calmed. And as I write this post I also realize that there is so much spinning wonderfully around me - Skipp's unyielding love, my beautiful Mom's love and faith and promise, my sis is doing better, my son is aspiring and happy with his life, my girls, for today are dealing with their crisis's, I am up and about and doing all good things for myself - exercise, healthy food with restricted salt, vitamins, fresh fruit and veggies, lean everything, whole grains and portion control - and Gracey-Blue sweet Gracey-Blue. Skipp is SO proud and SO happy to be holding her in his arms. Wow!! :-) Gracey-Blue is thrilled. On the ride home!! Enlarge to see her blue eyes!!! 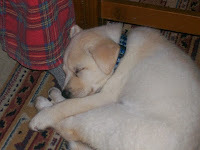 Here is Gracey-Blue settling in nicely- asleep under the table on my feet. Perfect. Here is Gracey-Blue upstairs with us - quite happy - so long as she is near us. :-) She is adjusting well to the house rules. Phew. Just a brief blog to let you all know we are doing well - very busy showing Gracey who is in charge - and the "Dog Whisperer" has wonderful techniques we are incorporating so Gracey 'listens' and follows our commands. Lots fo work, lots of love, lots of energy - Please know I am around reading and visitng your blogs but I don't have a lot of energy left over to comment too much. I am redefining my schedule. so to speak. I will post again once I/we have Gracey-Blue on a schedule. Phew. She is a beautiful handful. When she rests her trusting soft body on mine I am in heaven. Everything slows, and we feel only love and contentment. This patchwork quilt has quite a story to tell - a history if you will. I certainly had no idea where it would end up over the years. It is over nine years ago that she sat in my office. 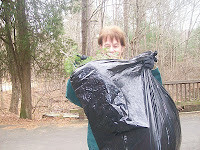 A young frail woman, smiling cautiously as she prepared to leave treatment - having successfully completed 2o days of in-patient treatment for substance abuse. My office, always welcoming, safe, peaceful, a haven for those who sought refuge and understanding, love and new life. My office was a gathering place - for clients and co-workers. There were times at lunch that folks had to stand because there wasn't enough space. 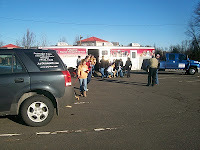 We hid for a while in huddled love and shared food to gain balance and strength to continue our work of serving those in need. Some days I would run small therapy groups in my office and the "work" they did in the intimate peaceful setting always left me humbled by their courage. This day,in late 2000, she sat in the high backed chair - holding the patchwork quilt close to her. She shared that her grandmother made it for her and that she took it with her every where. As she moved on from the treatment setting she would be going to a "Sober House" for women. She feared that the quilt would get stolen. She asked if she could leave it with me and that in time, less than a year she was sure, she would have her own place and then bring her quilt she loved so much "home". That was over nine years ago. Unfortunately she is one of the casualties of the devastating disease of addiction and a cold statistic representing so many who die from this disease. Her quilt was draped over that high-backed chair where she once sat holding it. And there it stayed as a comfort and security for thousands of other people choosing to be in treatment and who sat on that very quilt sharing their "truths" their "it's" with me. That quilt has heard it all- it holds their pain, their joy, their hope and courage, their faith, their love, their losses, their struggles and their successes - their lives are in the very fiber of the quilt you see pictured above. As my life changed and I was in my office less and less due to my illness I brought the quilt home. I have it draped over my vanity chair as a cushion of sorts and comfort as I primp in the morning with my hair and make-up. 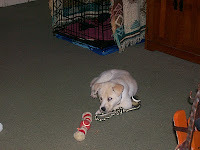 And then we came to know of "Gracey-Blue" - our new adorable puppy. 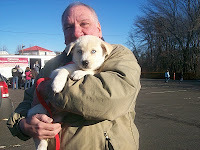 A rescue pup -on a transport bus from Arkansas today!. She was abandoned in the woods with her litter-mates and found wet and cold and raw with flea bites she scratched. She has been nurtured by a wonderful foster family along with her litter mates. They called her "ICY", we re-named her, "Gracey-Blue". 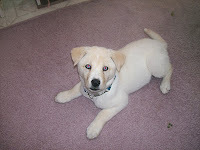 This is a picture of "Gracey-Blue" formerly known as "Icy"....... how cute is she? 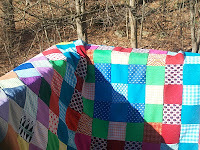 And so the patchwork quilt is being bestowed to Gracey-Blue to comfort her and keep her warm and snugly here, in her forever home. 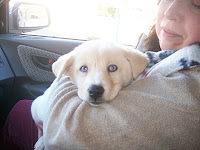 She is a golden retriever and husky mix and is three months old and she has beautiful bright ice- blue eyes. We are meeting her at the 'drop off' on Saturday morning with lots of other folks who are adopting rescue dogs. We are SO excited. Every time Skipp and I look at her pictures we both fill up with tears of joy. :-) I will post next week after she arrives and include pictures of her here, happy, with us. "YAY!!!! Sometimes my intuitiveness is both a gift and a curse. I know things, see things, feel things and history has proven that these intuitions are often accurate. I don't tell you this to brag because quite the opposite is true. I am humbled and often scared by these insights and intuitions and always challenged about what to do with the 'information'. Do I tell the person what I "see" or do I step away in silence - which can be deafening. The simple answer is both options are possible - it depends on the situation, the person and the intuition/information I am holding. Some awareness's are greater than others in regards to their potential liability. Today I had to share one of my intuitions with one of my daughters. I was quite frightened because no one really wants to hear the truth, or in this case, my intuition of the truth. I was very happy she listened - and she also agreed with much of what I felt and thought AND she is aware from within her own intuitive self of one particularly tragic possible scenario happening if interventions are not initiated and put in motion. Her struggle is that she feels her hands are tied and that she has done all she can do to "run interference" and that t he "system" is such that until tragedy strikes her shared concerns are dismissed. Regardless of her position, truthful or not, I spoke from my heart. I put my intuitive fears out on the table and offered to be part of any further initiation for interventions she chooses. In The Arms Of The Angels"
I am not sure why the picture fixed itself to the snow scene but it did. I tried to undo it and reposition it, but it wont separate. Oh well. 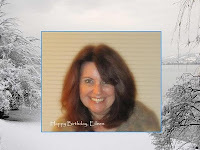 My wishes for YOU EILEEN are heartfelt and true - that this day, January 14th I celebrate you - your birth and your life!! So many lives have been inspired and given hope and known love because of you. YOU are writing chapters of your grand children's lives that are SO precious and so life-giving. YOU are a gift to the world. I feel SO honored to be part of that world and to receive the gift of you in blog land and in friendship. I am much better today than yesterday - the "icks" are still icky but I am not feeling them so much. I am back in balance. :-) This is just a brief post to say "THANK YOU ALL" for your love, shared wisdom, support and understanding. I feel so blessed that so many of you take the time to show you care. It is such a gift to know that "I am worth your while". That is a line from the movie "Bucket List". Jack Nicholson is in awe that Morgan Freeman found him to be, "worth his while". 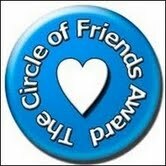 It was a real tribute to friendship and simple human kindness as is offered here, in blog land, so lovingly. I feel so blessed to have each and every one of you in my life. I want to thank ALL of you for your comforting and supportive and loving comments to me and for all the prayers for my sister, and for us all. ............................and so she laid quiet in ICU - doctors orders. After such a procedure one has to be still and lay flat. She had two blockages, which they cleared and they put in two stints to keep those effected areas open. I spoke to her - she shared of her fear going in for the procedure - of dieing, of her sons and all they have already lost, for our Mom and for me - my heart wrenched and ached listening - and at the same time I was soothed by the sound of her voice - my sister's voice. Despite the content - her voice was heavenly music - and then she paused, and began to tell of a woman they brought into her room - a patient, who was struggling with shortness of breath. Nancy could hear the family talking, a daughter, a husband, perhaps a brother as well and all of them trying to be supportive of their frightened loved one. Now I will "quote" my sister as best as I can recall. "I could hear the woman crying - she was saying why did I live and my son had to die , I shouldn't be here and he should - I don't understand. Her family tried to comfort her but she was so angry. Her family eventually left and I knew that I had to speak to her and share of my son's untimely death and I wondered, is this why this happened now, did God want me to be here for this hurting woman? And so my sister got out of her bed and went and sat by the woman's bed side - she told her of Clayton and her same questions about why did her son have to die - and why wasn't it her and on and on. She also told the woman that she has two other sons that need her and that she has a daughter that needs her too and they both cried together for their children still living that need them..................there is more to the miracle and love of this story but the details aren't important - but rather the message of hope, faith, and love. It brought to life, in real time, what I believe about our "truth". That all we hve to give, to offer one anotheris our truths - and here is my sister, in her own fear and pain - reaching out to this woman to share her truth - and there it is again, the miracle of Eucharist - to be broken and poured out so others can have hope. As my sister was sharing this miracle I could feel my heart fill with love and hope, my faith and understanding surrendered and opened - what, for a brief time I lost returned ten fold - and her voice, oh her voice, it was heavenly music to my ears and to my heart. 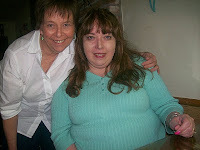 My sister will be home soon - needing time to heal and adjust some of her life habits. She will be referred to a cardiologist for follow-ups and rebuild her heart strength under his/her supervision. We are ALL relieved and hopeful and exhausted - sometimes the after shock is quite an emotional fall. "THANK YOU" ALL FOR YOUR LOVE, SUPPORT AND PRAYERS. And remember, that your truth shared could save someone's life. FREEDOM'S JUST ANOTHER WORD FOR NOTHING LEFT TO LOSE - Great line from the song 'Bobby McGee' - Did you folks know that Kris Kristoferson wrote that song? As I begin to reflect on the word "FREEDOM" - my focus word for 2010 I am reminded that freedom is founded in truth - often fact - acceptance and surrender - and so in honor of that I am re-posting an earlier piece titled "The Journey From Acceptance To Surrender". The journey from acceptance to surrender. It can be long or short, depending on what it is one is dealing with. Winning the lotto? Pretty quick journey! Being betrayed by someone you love? A diagnosis of a life-changing illness?? etc..... These are a longer and more difficult journey. Agreed? And since I started with a line from 'Bobby McGee', yup, I will leave you with the song. Enjoy, appreciate and honor ALL your freedoms.